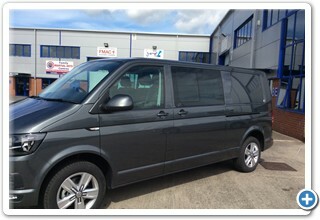 All our prices include a mileage allowance, insurance and VAT. We accept payments from major credit & debit cards including Mastercard and Visa, with no additional fees. 6 seat Kombi Vans are designed to cater for large groups of either family or friends and all the luggage that comes with such a sizable cluster of individuals. 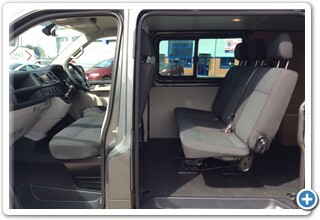 As with all large rental vehicles available from Leyland van hire, quality, safety, space and comfort is always guaranteed. 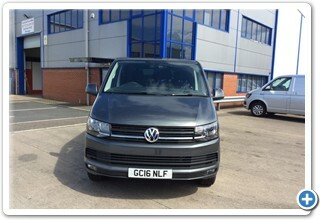 Popular choices for camping holidays thanks to their ability to hold and store all the necessary camping equipment, our 6 seat kombi Vans are also regularly used by cyclists on tour all across the country as the most practical support vehicle. Drivers need to be over 25 to hire this group of vehicle and a £250 cash deposit must be paid when hiring this vehicle, as well as payment for the hire by credit or debit card only no cash for the payment hire of the vehicle. We are conveniently located close to the M6 motorway network in Leyland. 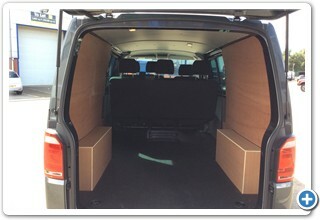 What is included in my van hire? The following are included: Up to 200 miles per day, fully insured and theft protection. NB: Over 200 miles per day there is a charge of £0.10 pence per extra mile. The inclusions for your particular rental will be clearly shown when booking and also on your rental documentation. If you have any questions, please do not hesitate to contact us by phone or email. What do I need to take to collect the vehicle? When collecting the vehicle the principal driver will need to bring their full UK driving license and a credit card in their name. It is often useful to bring a further means of identification - e.g. a passport. A refundable deposit of £100 is required on collection. A code issued to you by the DVLA share licence details scheme. Note: The code from DVLA is case sensitive and valid for 21 days. See our driving licence page for more details. Do I need both parts of a UK driving license? No - From June 8th 2015 we need the Photo Id card and a code from DVLA to access your details - see above. My licence has points, can I still hire a van? We cannot allow drivers with more than six penalty points on their driving licence or disqualified for any reason. In the event of any mechanical difficulties or accidents involving your van, it is important that you advise us as soon as possible, (within 24 hours). In the case of an accident the local police should be advised and a police report completed, and the full details of the 3rd party should also be taken. We must give authority to replace or repair a vehicle. It is important that you retain a copy of all documentation for your own records. What are the minimum and maximum ages to rent a vehicle? If you are aged under 25 or over 65 and are at all in doubt, please do not hesitate to contact us and we can run through all the available options with you. I returned my vehicle early - can I have a refund? Unfortunately we are unable to refund any unused days or make refunds on vehicles returned early. How are van hire 'days' calculated? Van Hire works on a 24 hour clock, so if you rent from 9am Monday to 9am Tuesday this is considered 1 day. If you rent from 9am Monday to 1pm Tuesday you have then passed 24 hours and have therefore entered a second day of rental and will therefore be charged for 2 days rental. Please therefore check your times carefully when booking as times can have a big impact on price. You will need to return the van with the same amount of fuel as collected. We will charge you for refuelling if this is not the case. Insurance does not usually cover taking vehicles, including four wheel drives off road or onto untarmacked tracks, so we strongly recommend that you do not do this as it may invalidate your insurance. What should I do if the van breaks down? In the event of any mechanical difficulties it is important that you advise us as soon as possible, (within 24 hours). We must give authority to replace or repair a vehicle. In the event of any unresolved difficulties, please do not hesitate to contact a member of our team. Please note it is not advisable to leave your vehicle in the event of a break down as contents are often not covered. Need extra storage space? click here for Self Storage Solutions. 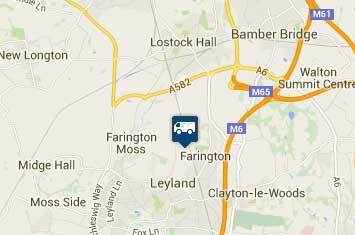 We are based in Leyland with convenient access to the motorway network (M6) click here to see our location map.